In Europe, pine nuts come from the Stone Pine (Pinus pinea), which has been cultivated for its nuts for over 6,000 years, and harvested from wild trees for far longer. The Swiss Pine (Pinus cembra) is also used to a very small extent. Pine nuts are often used to accent a dish and to bring out a subtle flavor. They are often used in pesto. Pine nuts are an ivory color that are about a 1/2 inch long. The Italian Stone Pine Nut is a torpedo shape while the the Chinese Pine Nut is more of a triangular shape. Choosing: Look for ivory, unblemished nuts that are uniform in appearance and size. Buying: Pine Nuts are found in the market alongside the other nuts, or in the baking section along with the baking nuts. Procuring: Pine Nuts are typically located on the ground and should be gathered before the first snow covers them up. Toasted Pine Nuts, Baked Pine Nuts, Warm Green Bean Salad with Pine Nuts and Basil, Roasted Broccoli W Lemon Garlic & Toasted Pine Nuts. Pine nuts are a common ingredient in pestos. They can also be used as a delicious nut component in baking [breads, cakes and cookies], and in salads and pastas. 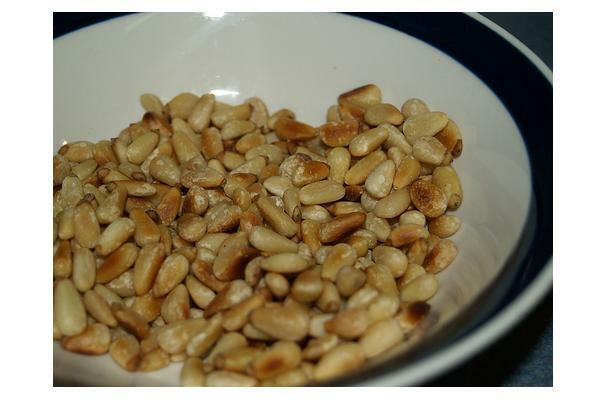 Cleaning: Pine Nuts can be cleaned in water to wash off any filth that might have gathered on them from the ground. Story Pine Nuts in the freezer for up to 9 months or in the refrigerator for 1 month. Pine Nuts will go bad very quickly, but the unshelled Pine Nuts have a long shelf life. Pine nuts are used to enhance other foods and dishes. Their sweet, somewhat bitter flavor adds a distinct flavor that can elevate the taste of other foods.